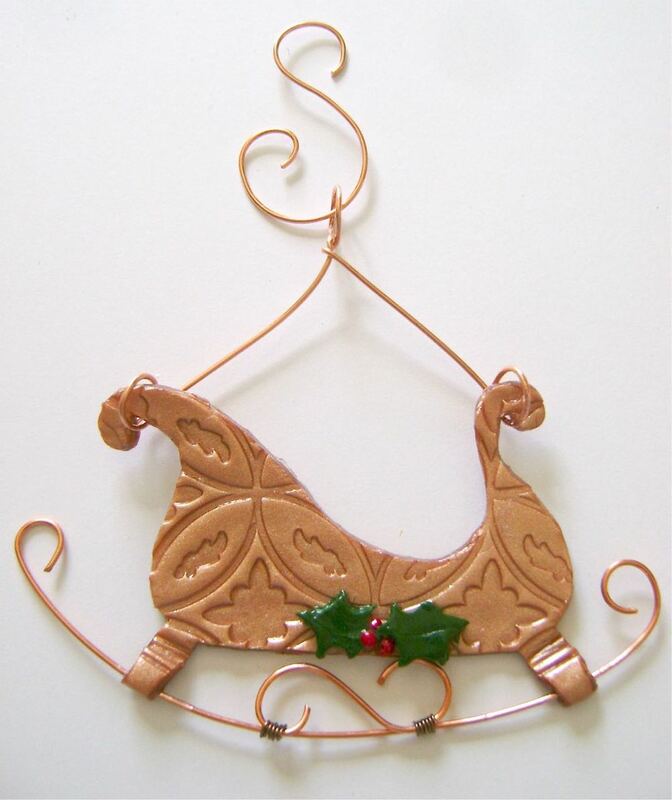 ornament measures 4" x 3"
Santa’s ride just got fancier with this shiny, copper, embossed sleigh. A unique ornament, this pretty project is made with clay and copper wire. You’ll find the free sleigh stencil with the directions. step 1 - Print and cut out the sleigh stencil. Condition and roll out copper clay to about 1/8 inch thick. Roll across a texture sheet to transfer the design onto the clay. step 2 - Decide where you want to position the sleigh stencil and what part of the design you want to use. step 3 - Place a piece of plastic wrap on the clay. Position the sleigh stencil over the plastic. Use the stencil as a guide for cutting the clay with a craft knife. step 4 - Cut out two additional sleigh legs from the extra copper clay. Set these pieces aside. step 5 - Condition and roll out a small piece of green clay and a tiny piece of red clay. Cover the green clay with plastic wrap then cut out two small holly leaves with the craft knife. Roll three tiny pieces of red clay between your fingers to create the berries. Position the holly and berries at the bottom of the sleigh. step 6 - Create the sleigh runner with a piece of 18 gauge copper wire about 6” long. Wrap the ends around a round object about the size of a marker. step 7 - Cut off the overlapping wire to result in a curl at the ends of the wire. Smooth the middle of the wire around a large round object to form it into a wide curve. step 8 - Cut another piece of wire about 3” long. Create the decorative “S” shape wire by wrapping one half of the wire around a marker in one direction and the other half in the opposite direction. Cut off the excess and curl the ends. step 9 - Use 22 gauge copper wire to wrap the decorative “S” shape to the center of the runner wire. Hold the pieces together and wrap the thin wire around them 4 times. Cut off the excess. step 10 - Place the runner on the legs of the sleigh. Press lightly into the clay. Cover with the extra leg pieces and press together. step 11 - Lightly pinch the ends of the clay together to seal them around the runner. Cut away excess clay close to the runner. Create decorative horizontal lines on the legs with an Etch n” Pearl tool. Step 12 - Bake the sleigh in a 275° oven for 30 minutes on a foil lined baking sheet. Let cool completely before handling. Use a brush to apply glaze to the back. When it’s dry, paint the front with two coats allowing them to dry in between applications. step 13 - Create a hanger for the sleigh with about 6” of 18 gauge wire. Bend the wire in half over a round object. Twist the long ends once to wrap them and create a center loop. Create loops on the wire ends. Both loops should be the same distance from the center so the sleigh will hang straight. Bend the loops to face each other and slip one curl of the sleigh into each. step 14 - Create a fancy “S” hook to hang the ornament.